Behind the high price tag, this is an exceptionally high-quality headset. A very comfortable and exceptionally high-performing gaming headset that is versatile and produces some of the best sound across every media. Gaming headsets with high price tags always cause us raise an eyebrow—it’s an indicator that, while big cost can be justified, the headset needs to do a lot right, and do it well. 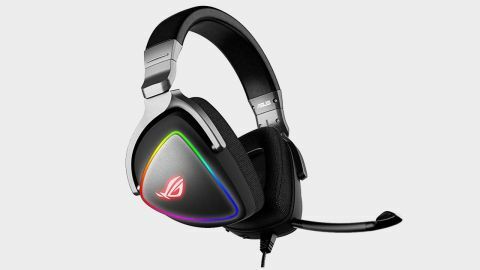 So when the Asus ROG DeltaRGB headset came in at $180 it was under pressure to perform. It’s definitely pitched as a premium gaming headset, with PC gaming first among its uses, but ASUS also thinks it’s versatile enough to be your go-to set of cans for all devices. The ROG Delta is a little larger than most everyday headsets, although the Delta sports triangular or D-shaped ear cups as opposed to the more traditional circular or oval shaped ones, making it seem bigger than it really is. From an aesthetic point of view, these are pretty cool, making for a distinctive look—it’s nice to see something different in a headset’s design—and from a comfort point of view, it works as well; these are as comfy as any other pair of cans I’ve tried. The tightest or smallest setting is for me, and could do with being a bit tighter perhaps, so they may not suit players will smaller heads. The headband is strong and sturdy and feels very secure in its build, like it could withstand falling off a desk easily. The hinges connecting and servicing the headband and cups are solid and flexible enough to contribute to that cosy fit, adjusting easily to the contours of your head. Onboard features are relatively limited, but the benefit of that is that the ear cups aren’t overloaded with extra buttons—it’s all minimal but effective. The detachable microphone is a movable, boom-type mic and is about perfect in size, plugging into the left earcup easily and firmly. It means that you won’t look ‘strange’ on your commute with a big old boom mic on your headphones—just unplug and leave at home. Feature-wise the mic has an on-board LED that glows red when its muted which is useful, and you mute it by using the volume and mic mute roller that's on the left cup. Having them on the same roller did lead me to accidentally mute the mic a couple of times. Elsewhere a USB-C connection is the primary means of attaching to your PC—a big nod to the direction of travel for connectivity—but there is an adapter cable to change it back to USB-2, adding only a little length overall. Otherwise, in the box there’s the usual guide booklets, as well as two extra pairs of earpads. The extra ones are leatherette and slightly thinner. This will mainly be a matter of preference but they are both comfortable; the thicker, material ones more conducive to long play sessions perhaps. While the audio settings and built-in DACs in the headset give it excellence straight out of the box, the Delta RGB headset comes with companion software for PC called ‘The Armory’. It offers deeper levels of customisation and optimisation and comes in a mixing deck format. Combine this with some lighting software to customise the RGB lights on the side of each, and potentially syncing up the lights if you have multiple Asus products using Aura Sync, and you have quite the customization package. To get a good handle on its performance, I plunged headfirst into the zeitgeist and played a long session of Apex Legends. Immediately my friends said that while my voice carried clearly and distinctly across game audio, it was joined by a slight buzzing (the buzzing was not present when I wasn’t speaking) which was a little disappointing but didn’t intrude much on the experience overall. The surround sound was neat, reliable and clear. In fact, whatever I was playing or listening to, the surround sound on these cans was genuinely excellent. Such was its quality in Apex that it directly informed and helped some in-game decision making. Moving one way or another, hearing the light rustle of footsteps and, of course, identifying gun fire, were all presented to my ears beautifully and crisply. Next up I jumped into The Division (the first one; getting my eye in again before trying the sequel) and as well as being able to react to enemy movements and fire excellently, the headphones picked up voices that seemed miles away, and the sound of the wind (bizarrely) came through nice and clear. Testing it out with more games, I turned to sessions of Wolfenstein 2 and Doom to see how the Delta copes with the lower end of the audio scale. Being true to the genre and setting the volume to high, I was seriously impressed with the Delta’s performance here. Not only did the surround sound continue to excel but the range of audio was captured superbly. Every soundtrack tune was a spectacle and every gunfire battle intense. My go-to title for testing the ‘higher’ end of the game-audio spectrum is currently Divinity Original Sin 2. Its medieval-fantasy soundtrack and dialogue-heavy gameplay provide a pleasant way to test a headset’s capabilities away from shooters and chaos. This test presented a little tinniness in dialogue, although and the music was a total delight. Taking it away from games, the ROG Delta is a strong performer in music. As indicated by playing the likes of Divinity Original Sin 2 and Doom, from orchestral music to heavy metal the headset produced beautiful, immersive sound quality that really was some of the best I’ve heard. When I tested the headset with movies and TV, it performed excellently here too with a sweet, rich sound. If you’re planning to use it for multiple medias, you’ll need to dig into the PC sound mixing software, which is easy to use as well as offering genuine benefits. The optimisations and pre-sets are genuinely good and the changes they make to the audio are clear. In a nutshell, this is an exceptional headset that is well worth the purchase. If you’re in the market for splashing the cash on a pair of premium cans then this is a straightforward, enthusiastic recommend. Asus provides a two-year warranty on the Delta RGB, which is a neat bonus, especially if you’re worried about the price.